This is a simple and fresh tasting bean dip. Put beans, onion, garlic, cumin, salt, pepper, and cilantro in food processor or blender. Process for about 5-6 seconds until thoroughly blended. 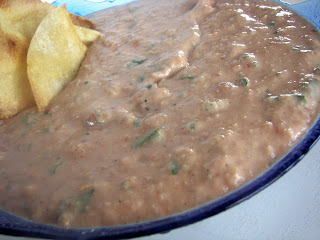 Pour mixture out of blender and add sour cream and salsa. Stir until well-blended. You can refrigerate this for several hours or overnight. This helps to blend all the flavors. Serve with corn chips. I love everything in it, so it must be great! How simple and i'll bet that when the flavors "marry" it is super. Kids would like this dip with chips! Have a great time blog-hopping!